About now we begin to yearn for warmer days, full of bright sunshine, when we can take off in our RVs. By the time the season has sloshed its way into February, we begin to be weary of the dark, damp days of winter. At the beginning of the month, we find out what happened in Punxsutawney, Pennsylvania, when the groundhog came out of his tree stump condo and glanced at his shadow. According to superstition, if he sees his shadow, six more weeks of winter are in store for us—no shadow means spring is coming in two weeks. But we do have Valentine’s Day to look forward to, and that means chocolate. Chocolate is a passion with many. There are those who sheepishly call themselves “chocoholics.” They suffer from helpless feelings when around it and find that its aromatic, dark, shiny appearance entraps them. Legend has it that chocolate came to the Aztecs as a gift from the Mexican god Quetzalcoatl, so it naturally brings to mind thoughts of luxury, opulence and pleasure. In 1519, Spanish explorer Hernando Cortés was served chocolate at one of Montezuma’s sumptuous banquets. When Cortés sailed back to Spain in 1528, he brought cocoa beans to the Spanish court and introduced chocolate to Europe. Cortés knew how to pick the pods from the cocoa trees, how to remove the beans inside, spread them out in the sun to ferment and dry roast them over a fire, and crush them to an aromatic paste that was mixed with water to make a beverage. It needed a little sweetening, so sugar cane was added. This made a rare and costly drink that the Spanish court simply adored and guarded jealously. In 1765, Dr. James Baker began the giant chocolate industry in the U.S. and in 1847 Fry & Sons introduced “eating chocolate.” In 1893, Milton Hershey became fascinated with a demonstration of German chocolate-making machinery and realized chocolate was a permanent thing and decided to go into the business of making it. We all know the rest of the story. Put 4 tablespoons of flour, 4 tablespoons of sugar and 2 tablespoons of cocoa in a larger microwave-safe mug and mix well. Add 1 egg and mix thoroughly. Pour in 3 tablespoons of milk and 3 tablespoons of vegetable oil and mix well. Add 3 tablespoons of chocolate chips and a small splash of vanilla and mix again. Put mug in the microwave and cook 3 minutes at 1,000 watts. Take a 6-oz. ready-to-fill chocolate-flavored crumb crust and sprinkle 1/2 cup of toasted pecan pieces over bottom of crust. Melt 1 1/2 cups of semisweet chocolate chips in pan over very low heat, stirring occasionally; cool slightly. Beat 1 cup of whipping cream in a large bowl with electric mixer until stiff peaks form; cover and refrigerate 1/2 of the cup for garnish. Beat cooled chocolate into the remaining stiff cream until blended. Beat 1/3 cup of ice-cold canned evaporated milk (not skim) until thick; beat into chocolate mixture. Spread over crust and refrigerate at least 15 minutes until set. Pour caramel sauce over top and serve. In a 9×9-inch ungreased pan, mix together the flour, cocoa, salt, sugar and baking soda. Add vegetable oil, vanilla, vinegar and water. Mix completely and bake in a preheated 350-degree oven for 25 minutes. In large bowl, beat cream cheese and butter until light and fluffy. Beat in egg and vanilla. Add cake mix and mix well (dough will be sticky). Cover and refrigerate for 2 hours. Roll rounded tablespoonfuls of dough into balls. Place 2 inches apart on ungreased baking sheets. Bake in preheated 350-degree for 9-11 minutes or until tops are cracked. Cool for 2 minutes before removing from pans to wire racks. 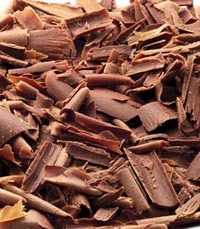 Most of us realize that chocolate is not eaten for good nutrition. It has fats, carbohydrates and stimulants such as caffeine. But it was once thought good for “plumping out the figure charmingly if mixed with powdered orchid bulbs.” Others claimed that if chocolate was scented with orange blossoms, it would soothe the nerves, or if mixed with milk of almonds, it would bolster a delicate stomach. HINT OF THE MONTH: When melting chocolate, be sure to use a very low heat to prevent it from scorching, which will cause it to taste bitter and to become grainy. If it becomes hard and lumpy when melted, a tiny drop of moisture from a wet spoon or the steam from the double boiler is most likely the cause. Marian Platt is a food writer who lives in Sequim, Washington.